Sentinel-3 is providing key observations addressing cryosphere’s evolution given that decreasing snow cover is one of the clearest indicators of a warming climate. Snow has a major influence on Earth’s radiation balance and it is also a very sensitive indicator of high latitude climate change, being closely related to shifts in temperature and precipitation regimes. Owing to its importance, snow albedo or reflectivity has been designated as an ECV and a Target Requirement for climate monitoring. A team lead by Professor Jason Box at the Geological Survey Denmark and Greenland, (GEUS) approaches the snow problem in two ways. Firstly, by studying the feasibility and benefit of snow model data assimilation of Sentinel-3’s optical data. Within this work frame, Marie Dumont, Head of the snowpack observation and modelling team from Centre d’Etudes de la Neige (CNRM/Meteo France-CNRS UMR3589) in Grenoble, will push data assimilation capabilities to the near-real time frame, thus serving operational models to improve flood and avalanche hazard forecasting. Another aspect of work related to snow involves field campaigns throughout 2017 and 2018 in Greenland, the French Alps and Antarctica. In Greenland, validation involves fixed-wing drone technology from Aberystwyth University, Wales, supported by the Glaciology Professor at GEUS, Jason Box, who said, “We’re planning to under-fly Sentinel-3 in June 2017 with a 2 m fixed-wing drone, carrying four bands matching Sentinel-3 and with significant overlap with NASA’s MODIS. Hall, D. K., G. A. Riggs, and V.V. Salomonson (1995). Development of Methods for Mapping Global Snow Cover Using Moderate Resolution Imaging Spectroradiometer Data. Remote Sensing of Environment, 54(2), 127-140. Hall, D. K., Riggs, G. A., and Salomonson, V. V.: MODIS/Terra Snow Cover Daily L3 Global 500m Grid V004, January to March 2003, Digital media, updated daily. National Snow and Ice Data Center, Boulder, CO, USA, 2011. Hall, D. K. and G. A. Riggs. 2016. MODIS/Terra Snow Cover Daily L3 Global 500m Grid, Version 6. Greenland coverage. Boulder, Colorado USA. NASA National Snow and Ice Data Center Distributed Active Archive Center. doi: http://dx.doi.org/10.5067/MODIS/MOD10A1.006. Accessed December, 2016. Lyapustin, A., et al. (2014), Science impact of MODIS C5 calibration degradation and C6+ improvements, Atmos. Meas. Tech. Discuss., 7, 7281–7319. Stroeve, J.: Assessment of Greenland albedo variability from the advanced very high resolution radiometer Polar Pathfinder data set, J. Geophys. Res.-Atmos., 106, 33989–34006, doi:10.1029/2001jd900072, 2001. Daily 0.5 km, 1 km and 5 km resolution Greenland, Arctic Canada and Iceland glaciated area albedo grids are available beginning April 2000 and (currently ending) September, 2017. The data are based on NASA MOD10A1 Collection 6 data with de-noising, gap filling, and bias correction after Box et al. (2017). An example (15 July 2016) of the daily 500 m x 500 m enhanced MOD10A1 Collection 6 albedo product presented in this article. The grids are available through PROMICE at 5 km resolution. Data at the native 500 m resolution and 1 km resolution are available on request (jeb at geus dot dk). The workshop starts Wednesday Sep 20 at 12.00, and ends Friday Sep 22 at 12.00. A PROMICE 10-year jubilee and reception is planned for the afternoon of Sep 22. This is workshop two as part of Danish Council for Independent Research (DFF) Natural Sciences program (FNU) project 4002-00234: Understanding and predicting non-linear change in the permeability of Greenland firn and has a special session co-sponsored by the ESA Scientific Exploitation of Operational Missions (SEOM) Sentinel-3 for Science, Land Study 1: SNOW. Session 1 welcomes, for example, model considerations of water availability vs. percolation rate vs. refreezing rate to explore the importance of heterogeneous percolation modelling in polar firn; fine-and-local scale/detailed modeling with possible suggestions to including bulk effects in larger-scale models; inclusion of piping (for instance, by “skipping layers” during percolation) in distributed or single-column models; inclusion of horizontal water motion in snow and firn, i.e. between grid cells. Session 2 will focus on discussions of useful model validation metrics and aim to compile observational datasets that may be used to validate the above processes. Session 3 will discuss and formulate a protocol for a meltwater retention model intercomparison project. consult users about the utility/interest in other snow products suitable for studying climate-related issues. a protocol for a retention model intercomparison project (RetMIP) including instructions and datasets for validation. a journal special issue like the 2016 special issue in Frontiers in Earth Science – Melt Water Retention Processes in Snow and Firn on Ice Sheets and Glaciers: Observations and Modeling, papers feeding into the IPCC Special Report on Climate change and the oceans and the cryosphere. Contributions are welcomed in the form of oral presentations and/or posters. Presentation duration will be 15-20 minutes, including discussion. One or more longer invited keynote presentations are planned. Those intending to attend the workshop should submit abstracts (maximum length 200 words) by email to Peter Langen (pla@dmi.dk) no later than the registration deadline Friday 18 August 2017. Abstracts should indicate whether an oral or poster presentation is preferred. We are working to raise some financial support for early career scientists to participate in the workshop. Please indicate at registration whether you will request support. A range of hotels and hostels exist near the workshop location. Public transit is very efficient, including bike rental. Booking these early is recommended due to high demand that may occur. illuminated by low solar angles, this late 2016 Sentinel-3 OLCI image spectacularly features Greenland ice sheet undulations. 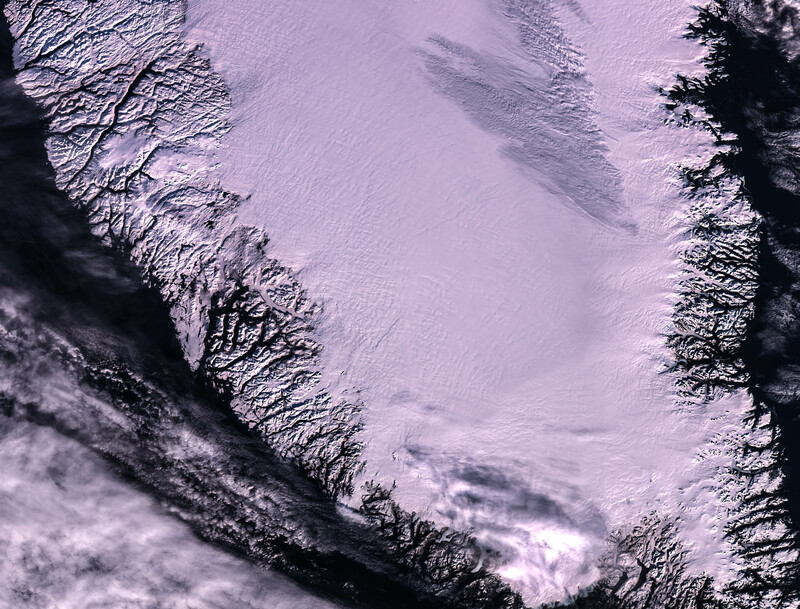 at a time when melting should be in full force and precipitation should perhaps be liquid that solid, Sentinel-3 OLCI provides views of a snow blanketed western Greenland ice sheet ablation area. (above) 5 July, 2017 1458 UTC, we see surface meltwater lakes poking through fresh snow and even some snow on land (NW quadrant of image). Field measurements are essential for testing the performance of new algorithms and validating satellite remote sensing products. Among the validation sites chosen for the project, Col du Lautaret, in the French Alps is an ideal validation site, as it offers easy access and a variety of conditions to test the performance and limits of our algorithms. The site is located at approximately 2000 meters (6500 feet) a.s.l. , and is surrounded by high rugged mountains. At the col (mountain pass) itself, where a permanent automated weather station is located, the terrain consists of a (rather) flat plateau, surrounded by steeper slopes. Perfect for testing the complex terrain algorithms! Furthermore, the conditions of the alpine snowpack are in constant evolution over the winter season, which allow the team to test Sentinel 3 images for a wide range of snow types. During Spring 2017, the french team performed regular surface albedo measurements, coinciding with Sentinel 2 and 3 overpasses. Initially the data will be used to perform the characterisation of the validation site. Later in the project, the ground albedo measurements will be compared to the satellite acquisitions. Of course, more measurements will be taken… we just need to wait for the snow to return! (above) Sentinel 2 and 3 images over the validation site. 11/03/2017. Source: ESA, Copernicus. The S3 4Sci Snow research project is gaining momentum, now with scripts that enable batch processing of two important steps: 1.) collocating OLCI and SLSTR imagery, that is, aligning pixels to a common geographic grid and 2.) converting the imagery to top of the atmosphere reflectance. 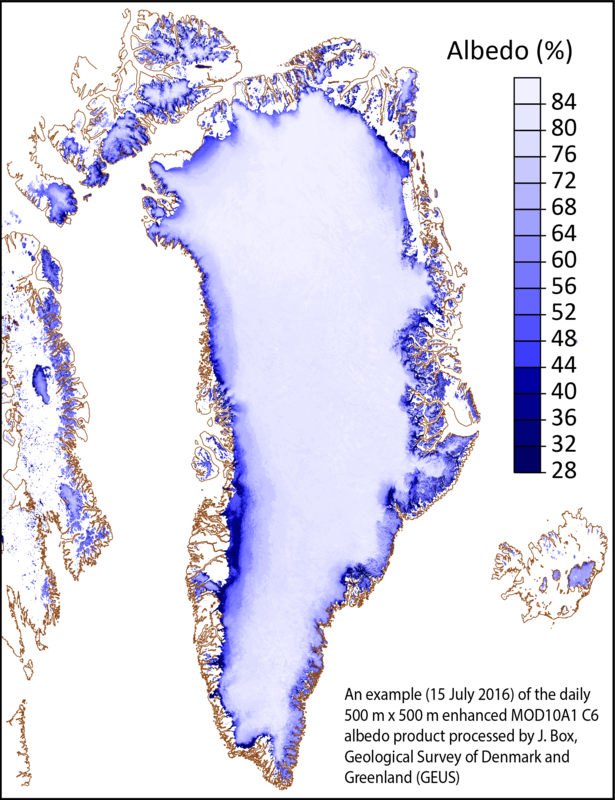 (above, 22 August 2016 southern Greenland Sentinel-3 scene of TOA reflectance from OLCI band 21, 1020 nm). In this part of the optical spectrum we find strong reflectance differences between fresh snow cover, melting snow and bare ice (dark areas). The processing chain the project follows is illustrated below. The collocation happens as OLCI and SLSTR radiances are combined. The col du Lautaret site, located in the heart of the French Alps, is used by the team as a validation target for the “ESA SEOM Sentinel-3 for Science Land Study: Snow S-3-Snow”” project. The site is host to numerous observations of the snowpack and the atmosphere which will be used as part of this contract, in parallel with other CNRS / Météo France funded projects. To account for the evolution of the snowpack a good repetitiveness of observations is necessary, therefore automated ground measurements are carried out during the winter season. Additionally, Sentinel 2 (L1C) data is being used as a inter-comparison tool, to test methods that will be applied to Sentinel 3 imagery. Above, a time-series animation from Sentinel-2 images aquired over the winter 2016-2017 (Maxim Lamare). This ESA SEOM Sentinel-3 for Science Land Study: Snow “S-3-Snow” includes an element to gather and prioritise snow modeller interest and requirements about optical remotely sensed snow parameters (snow extent, albedo, grain size, impurity content). The ESA contract is to engage users of Sentinel-3 snow optical retrievals in 1.) model comparison and/or 2.) data assimilation. Synergistic is a September 20-22, 2017 Copenhagen Workshop: Modeling Melt Water Retention Processes in Snow and Firn on Ice Sheets and Glaciers: Observations. to consult users about the utility/interest in other snow products suitable for studying climate-related issues. To be added to mailing list, please contact jeb@geus.dk charing the snow optical remote sensing session . For the ESA contract, the outcome is a list of requirements and minimum accuracy levels for the optical remotely sensed snow parameters. a protocol for a retention model intercomparison project (RetMIP?) including instructions and datasets for validation.